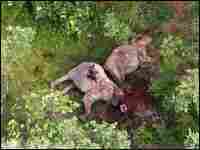 A pair of elephant corpses, their heads cut off to get to their precious ivory tusks, lie bloated in pools of blood outside a nature preserve in Chad. Explorer Mike Fay completed a number of incredible journeys in recent years. He led a ground-level survey of the seemingly impenetrable forests of central Africa, slogging by foot all the way from the Congo to the Atlantic Ocean. Later, he and a partner did the same thing in a small plane, documenting much of the continent's vistas and wildlife. 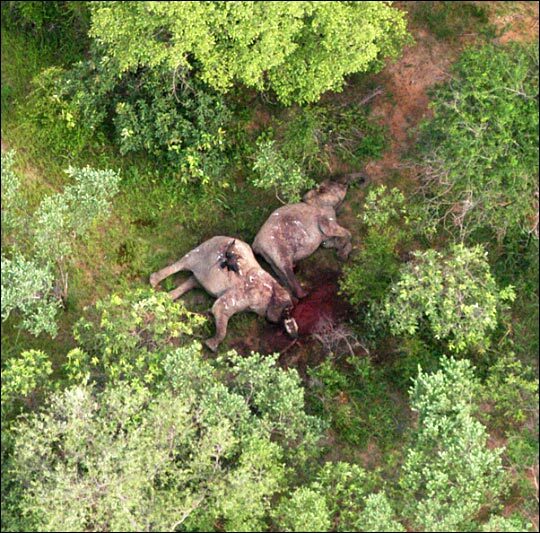 Now, Fay reports a staggering loss: During a survey of Chad while on assignment for the National Geographic Society, he stumbled on at least 100 dead elephants near an elephant preserve, killed for their ivory tusks. Their huge, bloated bodies were left behind for predators and vultures. "You can see very clearly the trunks are sliced off the heads and the tusks are chopped out, [and] big pools of blood," Fay says. "There is no doubt about it, these boys are being poached." The areas where elephants can be protected are getting smaller, he says. "Thirty years ago, there was a Texas-sized area that had about 300,000 elephants -- but over the past three decades, poachers have killed almost all the elephants." Fay believes part of the problem is the unrest in neighboring Sudan. Roving bands of horsemen cross the border from the troubled Darfur region to poach elephants. "The only way to keep this park protected is to up the guard force and get organized outside the national park, where the elephants go in the wet season," Fay says.